This page lists my work which has an applied, managerial slant and which may be of interest to strategists, consultants, organization development practitioners, and reflective practitioners. I have employed this and other research work in my executive development and consultancy engagements since 1997 (selected session abstracts can be found here). This page also lists some media articles or briefings featuring my research or commentary. My linkedin profile can be found here, and my Google Scholar citations can be found here. To get in touch please email loizos@heracleous.org or use the contact form at the homepage. How business is taking the space race to new frontiers. 2015. In The Conversation and in Fortune. What will it take to educate the next generation of thought-leaders for a complicated world? Heracleous, L. & Wirtz, J. 2014. 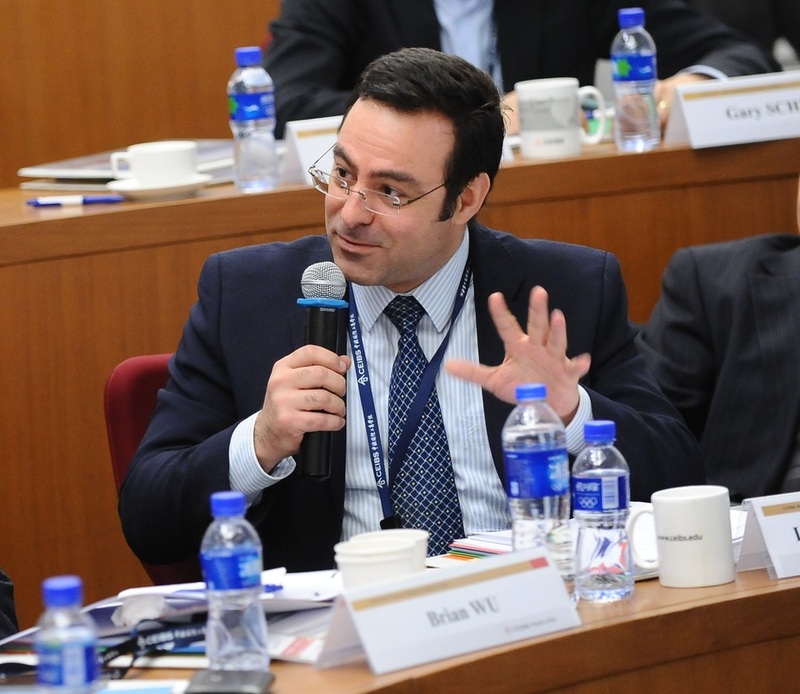 Sustainable competitive advantage at Singapore Airlines: Dual strategy as mastering paradox. Journal of Applied Behavioral Science. Outlines how Singapore Airlines builds competitive advantage by balancing dual capabilities, such as cost effective service excellence, and simultaneous centralized and decentralized innovation, seen as poles of four paradoxes. in Practice. Cambridge: Cambridge University Press. Describes a methodology for engaging managers in strategic thinking workshops using three dimensional materials, which they use to build representations of their business challenges. These metaphorical representations are decoded to deliver insights richer and qualitatively different than those delivered by conventional planning techniques. Notes that legally speaking Directors' duties are owed to the corporation as a legal person, rather than shareholders; which has important implications for directors' duties and on how we view corporate governance. Heracleous, L. & Wirtz, J. 2009. Achieving service excellence through innovation at Singapore Airlines. Effective Executive, June: 36-45. Describes Singapore Airlines' unique model of service innovation, which relies on a combination of structured, rigorous, centralized innovation led by the product innovation department together with soft, emergent, distributed innovation led by functional departments. Heracleous, L. & Rao, A. K. 2008. Systems thinking: The missing link in management education? Effective Executive, January: 47-49. Suggests that systems thinking as an approach to management education combines a holistic view of management challenges and relevance, together with a structured approach to learning. Heracleous, L. 2006. Competitive instinct: Taking strategy further. Interview in CIIM Management Review, 2(3): 2-6. Interview on themes of strategic alignment, core competencies and emergent strategy. Notes that many companies engage in corporate vote-buying, which is a legal action to take (unlike civil vote-buying), which companies often take for strategic reasons. Suggests that such actions must be pursued with transparency, fairness and due process to avoid potential allegations of impropriety. Offers an example of costly failure by the world's largest beverage corporations in penetrating China, and outlines some lessons for other corporations seeking to enter China. Heracleous, L. 1999. Why an effective board is vital for a company. Business Times, 10 March, p. 12. Outlines the main functions of boards of directors and why it is important for corporations and society that these functions are carried out effectively. As leaders, are we aware of our effects on others? 2016. We discuss the main "leadership externalities" that leaders need to be aware of. Heracleous, L. 2013. Quantum strategy at Apple Inc. Organizational Dynamics, 42: 92-99. Describes a novel view of strategy as the ability to implement positions and capabilities that had been considered distinct; and explains how Apple uses this strategy to achieve extraordinary performance. A related case study, Strategic leadership and innovation at Apple Inc, was overall winner of the Case Centre's case awards for 2013, over 17,511 other eligible cases. Heracleous, L. & Wirtz, J. 2010. Singapore Airlines' balancing act. Harvard Business Review, July-August: 145-149. Explains how Singapore Airlines manages to balance service excellence and continuous innovation, with intense levels of efficiency based on primary data from a multi-year study of the company. Heracleous, L., Wirtz, J., and Pangarkar, N. 2009. Flying High in a Competitive Industry: Secrets of the World’s Leading Airline (Revised edition). McGraw-Hill. This book is based on an in-depth case study of Singapore Airlines and seeks to describe the sources of the airline's competitive advantage including such aspects as what are the driving principles of its strategy, its underlying values, how it selects and develops people and how it innovates. Heracleous, L. & Johnston, R. 2009. Can business learn from the public sector? European Business Review, 21: 373-379. Challenges conventional wisdom suggesting that public sector entities should learn from the private sector, and sets out some potential lessons for business organizations based on case study research in leading public-sector entities. Outlines the importance and benefits of play in strategic thinking, compares playful approaches with traditional strategizing, and describes how to play with serious intent and the role of leadership in this process. Outlines the potential of biometrics technologies, beyond their security applications, to revolutionalize service delivery through personalization and added efficiency. Heracleous, L. & Wirtz, J. 2005. Biometrics - the new edge in service industries. Oxford on Business, May. Describes how biometric technologies have the potential to redefine customer experience in several industries, as well as offer competitive advantage for companies that make effective use of such technologies. Heracleous, L. & Jacobs, J. 2005. Playing to win. Oxford on Business, September. Explains the strategic functions of play-based workshops, with several examples based on symbolic constructions developed by senior managers in such workshops. Heracleous, L. 2004. Corporate social responsibility. Economic Post newspaper, 1 April, pp. 46-52 (in Greek). Discusses global CSR trends, potential benefits of CSR, how CSR can be integrated with corporate strategy, and how it can be evaluated. Heracleous, L. 2018. Space tourism economics - financing and regulating trips to the final frontier. The Conversation, 25 July. Heracleous, L. 2017. Don't panic - you'll still be able to fly to Europe after Brexit. Yahoo Finance, 16 August. Heracleous, L. 2016. Apple, Google, Facebook: Where would you put your money? The Conversation, 1 March. Heracleous, L. 2015. How business is taking the space race to new frontiers. The Conversation, 27 November. Republished in Fortune, Why Jeff Bezos has entered the space race, 30 November. City AM, 2014. 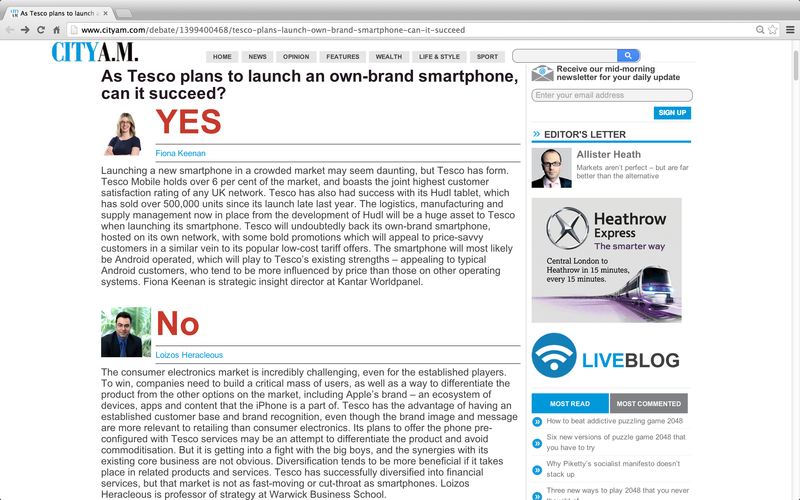 As Tesco plans to launch an own-brand smartphone, can it succeed? 6 May. Heracleous, L. 2013. What do Singapore Airlines and Apple Inc have in common? Quantum Strategy. BloombergBusinessweek management blog, 31 July. Heracleous, L. 2006. Competitive instinct: Taking strategy further. Interview in CIIM Management Review, 2(3):2-6. Heracleous, L. & Jacobs, C. 2005. Playing to win. Oxford on Business, September. Heracleous, L. 2004. The strategic role of the board. Corporate Governance Executive, no. 243, January. Heracleous, L. 1995. Spinning a brand new cultural web. People Management, 2 November, pp. 24-27. Financial Times. 2017. China's Huawei to expand in tough PC market with new laptop. 2 May. Economist. 2016. Alaska Airlines' purchase of Virgin America could start a new wave of consolidation. 5 April. Paredes, D. 2015. 6 'interrelated factors' that can lead to corporate failure. CIO New Zealand, 29 November. Bourke, J. 2015. Ryanair aims for 180 million passengers by 2024. The Independent, 3 November. Trenholm, R. 2015. Apple faces $862m fine after losing processor patent dispute. CNET, 14 October. BBC News. 2015. Toshiba Chief Executive resigns over scandal. 21 July. Cave, A. 2014. To boldly go. How a British business school would change NASA. Forbes, 15 October. Snyder, B. 2014. What technology execs can still learn from Steve Jobs ... and Aristotle. Infoworld, 2 October. BloombergBusinessweek, 2014. Why Steve Jobs was such a charismatic leader. 30 September. Cave, A. 2014. What Apple's Steve Jobs could teach Aristotle. Forbes, 29 September. Snyder, B. 2013. Why Apple has thrived while Dell may die. Infoworld, 25 July. PenTest Magazine, 2013. Interview with Loizos Heracleous about Dell and its 79% fall in profits. June (02): 54-56. Bradshaw, D., 2013. Warwick, Harvard and Insead scoop "Oscars" of the publishing world, Financial Times Business School news, 25 February. BBC, 2012. Delta to buy Virgin stake from Singapore Airlines. BBC News, 11 December. Full commentary on this story is here: Loizos Heracleous talks to BBC about Delta and Virgin's new deal. Sanjai, P. R. 2012. Divergent routes, one destination. Livemint (India), 14 February. Sanjai, P. R. 2011. Air India sets annual targets to increase revenue, reduce costs. Livemint (India), 9 April. Sanjai, P. R. & Roy, A. 2011. Banks to run checks on health of airlines. Livemint (India), 7 March. Teo, A. 2010. SIA's success secret is a tough balancing act. Business Times (Singapore), 29 July. Kaur, K. 2006. The write stuff on SIA: Balancing service quality and profits. The Straits Times (Singapore), 19 January. Tan, M. P. 2006. Keep costs low and fly high. The New Paper (Singapore), 19 January. Sreenivasan, V. 2006. Secret of SIA's success: Tight alignment of core competencies. Business Times (Singapore), 18 January. MBA Live, 2004. How strategy helps sustain competitive advantages, July, pp. 4-5. The Asian Banker Journal, 2000. Leadership and the composition of the board, April, Issue 21, pp. 36-37.